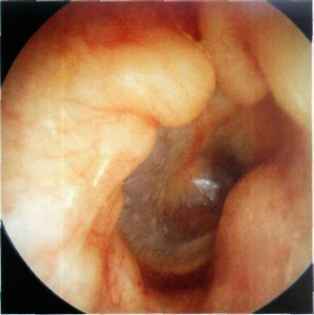 The good fortune of otology resides in the fact that in most cases a diagnosis can be established through careful otoscopic examination: the tympanic membrane is the window to the middle ear. Modern optical systems, in particular the binocular microscope, have permitted an unfettered approach and the detailed observation of the tympanic membrane under optimal conditions of lighting and magnification. The addition of observer tubes and video cameras have helped to further familiarize ourselves with the various pathologic conditions. However, the tympanic membrane has long defended itself from photographic intrusion. Inclined in relation to the three spatial planes, and of a diameter of 1 cm (while the normal canal accepts only a 4 mm speculum), it is only through progressive scanning that we view the totality of the surface. Our brain reconstructs the virtual image. Thus, otoscopic photography faces a formidable challenge: to reproduce not what one sees but what one imagines. 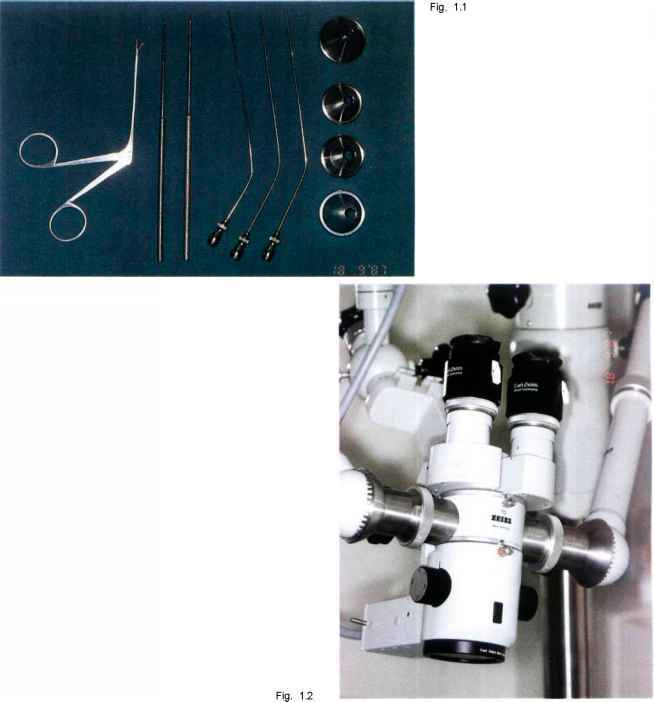 The solution came with the introduction of the Hopkins optical system, which provides wide angle capability through a narrow diameter endoscope, affording an enlarged field of vision and greater depth of field with increased light transmission. The principle is simple; however, utilization of the equipment necessitates a certain degree of experience to obtain quality pictures with regularity. Through my father, to whom I am indebted, I acquired a passion for photography, permitting me to acquire the necessary experience and subsequently to share it. This is the reason for which I feel honored, as friend and colleague, to preface this remarkable volume. Having perfectly mastered the technical problems, we note with real pleasure that Dr. Sanna and his collaborators offer us more than an "Atlas of Otoscopy", as the title of the volume modestly suggests. It is truly a "Manual of Otology" in that it covers all aspects of inflammatory, infectious, and tumor pathology of the ear, as seen through modifications of the otoscopic image. The reader, initially attracted by a book of pictures, will be further captivated by a concise text, where, with style and precision, the principal pathologic conditions are described: definition, nature, pathogenesis, and classification accompanied by diagrams. 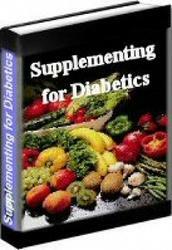 The text indicates as well the complementary examinations indispensable for diagnosis and available therapeutic options. Thus, radiographic images (CT scan, MRI) are juxtaposed with the otoscopic view when deemed appropriate. All pertinent information conforms to the most recently available sources and reflects the consensus of the scientific community. A particularly interesting and original aspect is represented by the last chapters which deal with the pathology of the skull base: cholesteatoma of the petrosa, glomus tumors, meningoencephalic herniations, areas in which Dr. Sanna has special experience which he shares with us. The resident or practitioner desirous of an initiation into otology will find a presentation of auricular pathology which is both general and detailed. Such a structure is thoroughly complementary to the knowledge acquired during his or her medical training. The well-informed otorhinolaryngologist will find an update of the most recent clinical, radiologic, and therapeutic acquisitions in a field which is in constant evolution. Despite advances in diagnostic techniques and imaging modalities, otoscopy remains the cornerstone in the diagnosis of otologic diseases. Every otolaryngolo-gist, pediatrician, or even general practitioner dealing with ear diseases should have a good knowledge of otoscopy. This atlas is based on 15 years of experience in the Gruppo Otologico in the treatment of otologic and neurotologic disorders. It presents a vast collection of otoscopic views of a variety of lesions that can affect the ear and temporal bone. Many examples are given for each disease so that the reader becomes acquainted with the variable presentations each pathology can have. While otoscopy alone can establish the diagnosis in some cases, parameters such as history, or audiolog-ical and neuroradiological evaluation are required in others. An important aspect of this atlas is that it juxtaposes, when appropriate, the clinical picture, radiological diagnosis, and intraoperative findings with the otoscopic findings of the patient. Needless to say, every patient should be considered as a whole and in some particular cases, the otoscopic findings might only be the "tip of the iceberg." Otalgia, otorrhea, and granulations in the external auditory canal are manifestations of otitis externa, but when they persist, particularly in the elderly, they should arouse suspicion of malignancy. Otitis media with effusion can be a simple disease when seen in children, whereas unilateral persistent otitis media with effusion in an adult may be the only sign of a nasopharyngeal carcinoma. A small attic perforation in the presence of facial nerve paralysis and sensorineural hearing loss may be all that is seen in a giant petrous bone cholesteatoma. 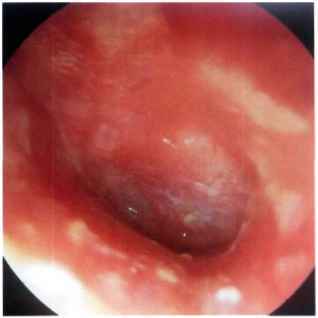 The manifestation of an aural polyp can vary from a mucosal polyp associated with chronic suppurative otitis media to the much less common but more dangerous glomus jugulare tumor. A small retrotympanic mass may represent an anomalous anatomy such as a high jugular bulb or an aberrant carotid artery. It may also represent frank pathology such as facial nerve neuroma, congenital cholesteatoma, or even en-plaque menin-gioma. In each chapter, a surgical summary that lists the different approaches for the management of the pathology dealt with is provided. Throughout the book, emphasis is on how the otoscopic view and the clinical picture may affect the choice of treatment and the surgical technique. At the end of this atlas, a chapter on postsurgical conditions is presented. The presence of previous surgery poses special difficulties because of the distorted anatomy. Moreover, the otologist should be able to distinguish between what is considered to be normal postsurgical healing and complications that need further intervention. The authors would like to thank Dr. Clifford Bergman, medical editor at Georg Thieme Verlag, for his excellent cooperation and help. Thanks also go to Paolo Piazza, neuroradiologist, for his continuous cooperation and to Maurizio Guida for the illustrations included in the book. Cholesteatoma of the External Auditory Canal 15 Carcinoma of the External Auditory Canal. 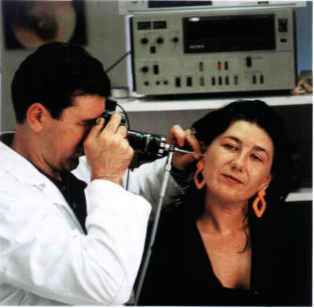 . .
A preliminary examination is carried out using a head mirror or an otoscope. 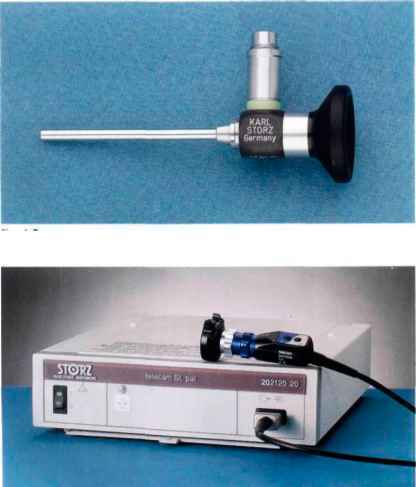 The use of a rigid 0° 6-cm endoscope (1215AA-Storz, Fig. 1.3) connected to a video system enables the patient to see the pathology involving his/her ear (Figs. 1.4 and 1.5 show the Endovision Telecam SL 20212001 and the Xenon Light Source 615-Storz). With the help of a video printer connected to the monitor, instant photos of the pathology can be obtained. The rigid 30° endoscope allows evaluation of attic retraction pockets, the extent of which cannot always be determined using the microscope or the 0° endoscope (Fig. 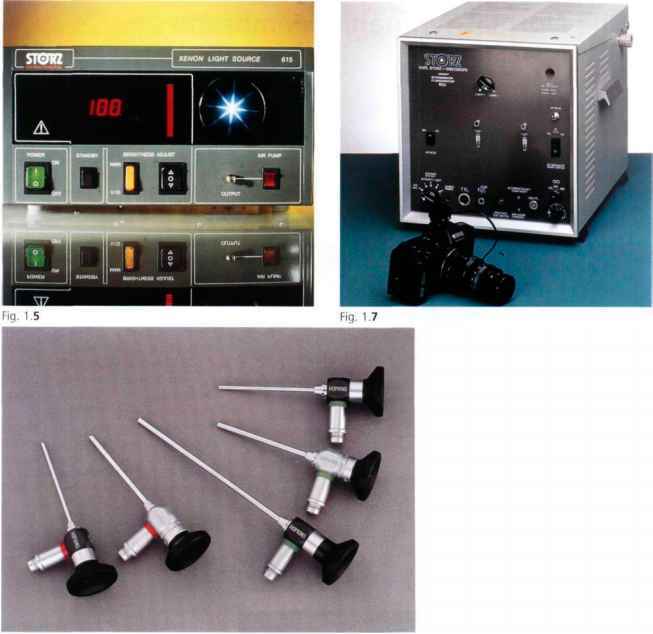 1.6 shows a series of rigid endoscopes -Storz). During the last few years, instant photography has also been used in the operating room. A copy of the important steps of the operation is given to the patient while another copy is kept in the patient's chart. The patient is also photographed during the follow-up visit. Thus, for each patient pre-, intra-, and postoperative photographic documentation is obtained. All the photos in this book were obtained with an Olympus OM 40 camera mounted to the endoscope with a Storz 593-T2 objective. The focus is adjusted to infinity and the diaphragm to 140. We use the TTL-Computer-Flash-Unit Model 600 BA Storz (Fig. 1.7). The film used is a Kodak Ektachrome 64T Professional Film (Tungsten). In all the cases, the examiner sits to the side of the patient whose head is slightly tilted towards the contralateral side. The examiner holds the camera attached to the endoscope with his right hand. With the ring and middle finger of the left hand, the examiner pulls the patient's auricle backwards and outwards to straighten the external auditory canal. The endoscope is advanced over the index finger of the examiner's left hand into the patient's external auditory canal. In this manner, any undue injury to the external auditory canal is prevented (Fig. 1.8). Figure 2.2 Right ear. Structures of the middle ear seen after removal of the tympanic membrane. 9 = pyramidal eminence; co = cochleariform process; f = facial nerve; j = incudostapedial joint. See legend to Figure 2.1 for other numbers and abbreviations. Figure 2.1 Right ear. Normal tympanic membrane. 1 = pars flaccida; 2 = short process of the malleus; 3 = handle of the malleus; 4 = umbo; 5 = supratubal recess; 6 = tubal orifice; 7 = hypotympanic air cells; 8 = stapedius tendon; c = chorda tympani; I = incus; P = promontory; o = oval window; R = round window; T = tensor tympani; A = annulus. Figure 2.3 Right ear. 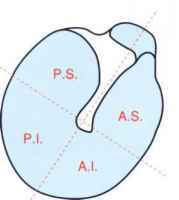 Division of the tympanic membrane into four quadrants: A.S. = anterosuperior; A.I. = anteroinferior; PS = posterosuperior; P.I. = posteroinferior. This division facilitates the description of different pathologic affections of the tympanic membrane. the malleus to the tympanic sulcus, thus forming the inferior limit of the pars flaccida of Sharpnell's membrane. The membrane forms an obtuse angle with the posterior wall of the external auditory canal. It also forms an acute angle with the anterior wall of the canal. It is important to respect this acute angulation in the myringoplasty operation to maintain as much as possible the vibratory mechanism of the tympanic membrane and hence ensure maximum hearing improvement. The external surface of the tympanic membrane is innervated by the auriculotemporal nerve and the auricular branch of the vagus nerve, whereas the inner surface is supplied by Jacobson's nerve, a branch of the glossopharyngeal nerve. The blood supply is derived from the deep auricular and anterior tympanic arteries. Both are branches of the maxillary artery. The tympanic membrane consists of three layers: an outer epithelial layer continuous with the skin of the external auditory canal, a middle fibrous layer or lamina propria, and an inner mucosal layer continuous with the lining of the tympanic cavity. The epidermis or outer layer is divided into the stratum corneum, the stratum granulosum, the stratum spinosum, and the stratum basale, which is the deepest layer that rests on the basement membrane. The lamina propria is characterized by the presence of collagen fibers. In the pars tensa, these fibers are arranged in two basic layers: an outer radial layer that originates from the inferior part of the handle of the malleus and inserts in the annulus, and an inner circular layer that originates primarily from the short process of the malleus. Such a distinct arrangement, however, is absent in the pars flaccida. The mucosal layer is formed mainly of a simple cuboidal or columnar epithelium. The free surface of the cells possesses numerous microvilli. Figure 2.4 Left ear. 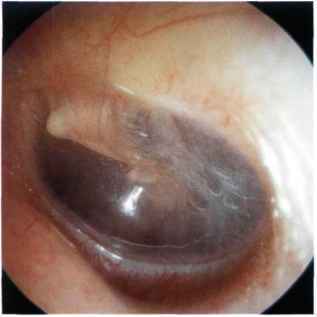 Normal tympanic membrane. Note the acute angle formed between the tympanic membrane and the anterior wall of the external auditory canal. The pars tensa with the short process of the handle of the malleus, the umbo, the cone of light, the annulus, and the pars flaccida are seen. Note also the presence of early exostosis in the superior wall of the external auditory canal. Figure 2.5 Right ear. Normal tympanic membrane. In this case, the drum is very thin and transparent. The handle and short process of the malleus as well as the umbo and cone of light are well visualized. Through the transparent tympanic membrane, the region of the oval window, the long process of the incus, the posterior arc of the stapes, the incudostape-dial joint, the round window, and the promontory can be distinguished. Anteriorly, at the region of the eustachian tube, the tensor tympani canal and the supratubaric recess can be observed. Figure 2.6 Left ear. Normal tympanic membrane. The han-die of the malleus and cone of light are well visualized through the tympanic membrane; the promontory, the area of the round window, and the air cells in the hypotympanum can be appreciated. The pars flaccida is visualized superior to the short process of the malleus. Figure 2.7 Right ear. Normal tympanic membrane. The drum, however, is slightly thickened with an accentuated capillary network along the handle of the malleus. The increased thickness of the tympanic membrane obscures all the structures in the middle ear. Figure 2.8 Left ear. 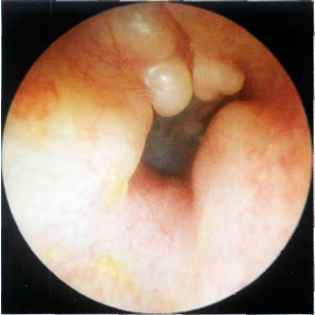 A normal tympanic membrane that is slightly thinned in the anterior quadrant and moderately thickened posteriorly. Exostoses are defined as new bony growths in the osseous portion of the external auditory canal. They are usually multiple, bilateral, and are commonly sessile. They vary in shape, being either round, ovoid, or oblong. The condition is caused by periostitis secondary to exposure to cold water. This explains the high incidence of exostoses among divers and cold-water bathers. Histologically, they are formed from parallel layers of newly-formed bone. It is postulated that the periosteum stimulates an osteogenic reaction with each exposure to cold water, thus causing this stratification. When exostoses are small they are asymptomatic. Large lesions, however, can occlude the external auditory canal and lead to conductive hearing loss or reten tion of wax and debris with subsequent otitis externa. In such cases, and in cases in which a hearing aid is to be fitted, surgical removal of exostoses is indicated. In some cases, surgery is technically difficult and special care is taken to preserve the skin of the external auditory canal. Other structures at risk are the tympanic membrane and ossicular chain medially, the temporo-mandibular joint anteriorly, and the third segment of the facial nerve posteroinferiorly. A postauricular incision is preferred because it allows good exposure and proper replacement of the skin of the external auditory canal to prevent postoperative scarring and stenosis. Osteoma is a true benign neoplasm of the bone of the external auditory canal, usually unilateral and pedunculated. Histologically, it can be differentiated from exostosis by the absence of the laminated growth pattern. Figure 3.1 Right ear. Small exostosis originating from the superior wall of the external auditory canal. Anterosuperiorly, another exostosis is seen in the early phase of formation. Figure 3.2 Right ear. 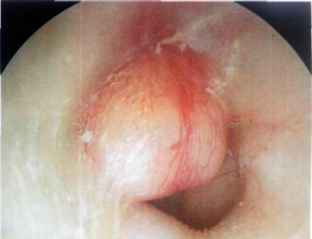 A small asymptomatic exostosis of the superior wall of the external auditory canal is observed. A hump of the anterior wall precludes adequate visualization of the entire tympanic membrane. Figure 3.3 Right ear. Osseous neoplasm of the external auditory canal. In this case, given the pedunculated narrow base, an osteoma is a more probable diagnosis. This was confirmed by pathological examination of the removed specimen. Ample bone removal is performed in such cases to avoid recurrence. 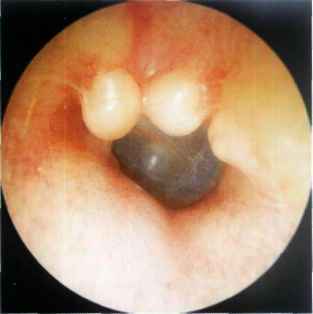 Figure 3.4 Exostosis of the superior wall of the left external auditory canal. 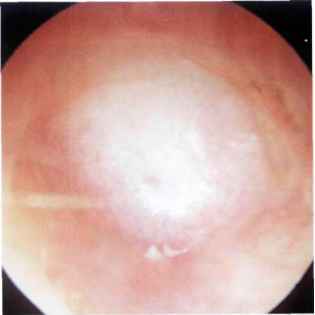 The lesion prevents complete visualization of the tympanic membrane. Figure 3.5 Same patient, right ear. Two exostoses are present in the superior wall of the external auditory canal. In addition, the anterosuperior wall shows an additional exostosis. 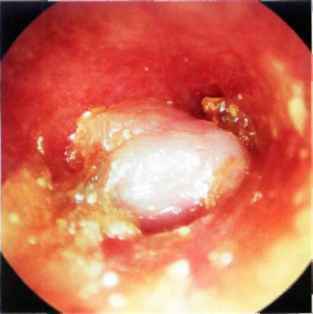 The lesions allow only a limited view of the central part of the tympanic membrane. In this case, a regular follow-up and evaluation is necessary because further growth of the lesion could lead to accumulation of debris and cerumen, necessitating surgical intervention. Figure 3.6 Right ear. Exostosis of the posterior superior wall of the external auditory canal that precludes visualization of the pars flaccida. A bony hump is also present in the anterior wall of the canal. In such a case, it is useful to photograph the ear for further follow-up within 1-2 years. Figure 3.7a Left ear. Obstructing exostosis that causes subtotal occlusion of the external auditory canal. The patient complains of hearing loss and frequent episodes of otitis externa secondary to retention of water and debris inside the canal. A canalplasty under local anesthesia is indicated to restore the size of the external canal. Figure 3.7b Computed tomography (CT) of the same case. The bony external canal is particularly narrowed. 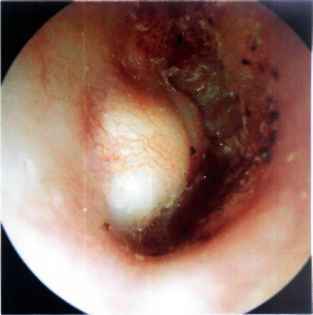 Figure 3.8 Obstructing exostosis of the external auditory canal resulting in otitis externa due to accumulation of squamous debris inside the canal. Surgery is essential both to avoid the formation of cholesteatoma and to improve hearing. Surgery in cases of exostosis is indicated only in cases with obstructing stenosis with or without hearing loss but with frequent otitis externa due to retention of debris. Surgery can be performed under local anesthesia, preferably using a postauricular incision. This approach allows excellent exposure of the whole meatus, thus minimizing the risk of injury to the tympanic membrane. In addition, it enables the surgeon to preserve the canal skin, thereby avoiding postoperative cicatricial stenosis. After dissecting the posterior limb, the flap is retained by the prongs of the self-retaining retractor. The skin of the anterior wall is incised medial to the tragus and is dissected in a lateral-to-medial direction. While drilling the exos-tosis, the skin of the canal is protected using an aluminum sheet (the cover of surgical sutures). Osteoma can be removed by using a curette. In case of recurrence, a wide drilling of the bone around its base is also indicated. Furunculosis is pustular folliculitis caused by staphylococcal infection of a hair follicle. 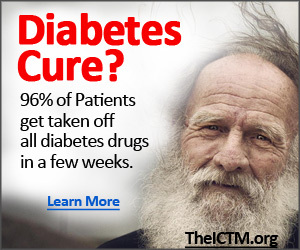 Infection occurs as a result of microabrasion or of decreased immunity, as in diabetics. It is characterized by severe pain. A tender swelling is seen in the cartilaginous part of the external auditory canal which may have a central necrotic part. Figure 3.9 A furuncle almost totally occluding the meatus. Pain is caused by distention of the richly innervated skin. A central necrotic part is seen. Figure 3.10 Left ear. 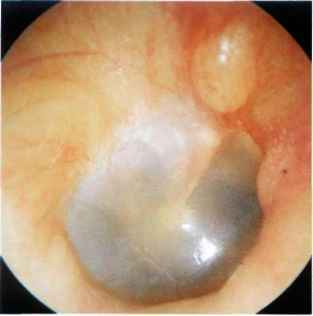 The tympanic membrane is characterized by thickening and hyperemia. In this case, the skin of the external auditory canal is also hyperemic. The tympanic membrane seems lateralized. Myringitis is an inflammatory process that affects the tympanic membrane. Three forms are recognized: acute myringitis, bullous myringitis, and myringitis granulomatosa. Acute myringitis is usually seen in association with infection of the external ear (otitis externa) or middle ear (otitis media). 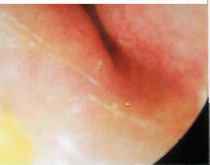 It is characterized by hyperemia and thickening of the tympanic membrane, as well as the presence of purulent secretions (Fig. 3.10). Therapy consists of administration of general and/or local antibiotics and local steroids. Bullous myringitis is commonly associated with viral upper respiratory tract infection. It is characterized by the presence of bullae filled with sero-sanguineous fluid. The bullae are located between the outer and middle layers of the tympanic membrane. The patient complains of otalgia and hearing loss. Therapy consists of antibiotics and steroids (Figs. 3.11, 3.12). 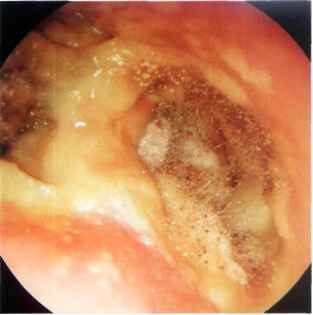 In granulomatous myringitis, the outer epidermic layer of the tympanic membrane as well as the adjacent skin of the external auditory canal are replaced by granulation tissue. It is generally seen in patients suffering from frequent episodes of otitis externa. In some cases, it may ultimately lead to stenosis of the most medial part of the external auditory canal. It can usually be cured, however, by removing the granulations in the outpatient clinic using the microscope. This is followed by the administration of local steroid drops for nearly 1 month. In refractory cases, however, surgery in the form of canalplasty with free skin graft is necessary. 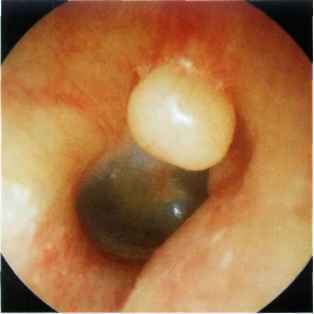 Figure 3.11 Left tympanic membrane with a large bulla anterior to the malleus and a smaller one posterior to it. 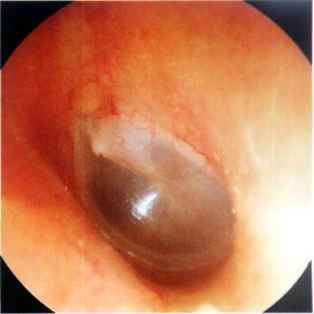 Figure 3.12 Right tympanic membrane with a large bulla occupying the entire surface of the membrane. The malleus is not visible. Figure 3.13 Granulomatous myringitis. 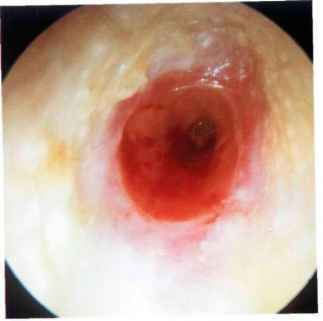 The granulomatous tissue has replaced the external skin layer of the tympanic membrane and part of the anterior wall of the external canal. This case was treated by removal of the granulation tissue under local anesthesia in the outpatient clinic. Local steroid drops were then administered for 1 month. administered for 1 month. On follow-up, stenosis was already resolved and the granulation tissue in the external auditory canal was completely replaced by healthy skin. Figure 3.15 CT of the same case. The bony walls of the external auditory canal are intact. The pathologic skin occupies the lumen of the external auditory canal. 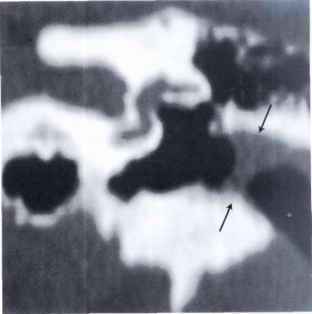 Figure 3.17 This CT scan demonstrates a similar lesion on the contralateral side. Figure 3.16 Same patient, left ear (see also CT in Fig. 3.18). A canalplasty was performed on this side. After having removed the granulation tissue, myringoplasty and canalplasty were performed. Next, the meatal flaps were repositioned. 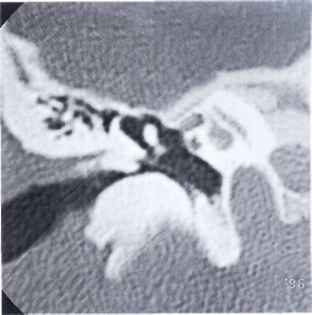 Figure 3.19 The CT scan shows thickening of the tympanic membrane and normal bony canal. Figure 3.18 Right ear. Case similar to that seen in Figure 3.14. The patient complained of intermittent otorrhea and hearing loss (see CT scan in Fig. 3.19). Figure 3.21 CT Scan of the previous case. The tympanic membrane is thickened and lateralized. 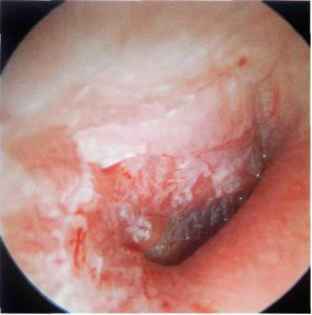 Postinflammatory stenosis of the external auditory canal is a difficult pathology to treat. In early cases, in which only granulation tissue is present, it is possible to remove the pathologic tissue (under local anesthesia in the outpatient clinic). This is followed by the insertion of a plastic (polyethylene) sheet to be left in place for about 20 days during which regular lavage is performed with 2% boric acid in 70% alcohol and local steroid lotions are applied. Surgery is doubtful in well-established cases with excessive cicatricial tissue leading to marked narrowing of the external auditory canal and lateralization of the tympanic membrane (secondary to thickening of the latter). In the majority of cases, restenosis occurs following operative interference. Therefore, it is preferable not to operate in the case of unilateral postinflammatory stenosis. In bilateral cases with marked hearing loss, a hearing aid is prescribed. By contrast, postoperative stenosis has a better prognosis and the results of treatment are more encouraging. Figure 3.22 Right ear. Radical mastoid cavity showing cholesteatoma with superimposed fungal infection. Otomycosis is more common in tropical and subtropical countries. In the majority of cases, the isolated fungi are of the Aspergillus (niger, fumigatus, flave-scens, albus) or the Candida species. Otomycosis is more common in immunocompromised patients and in diabetics. Local factors that favor fungal infections include chronic otorrhea and the presence of epithelial debris. 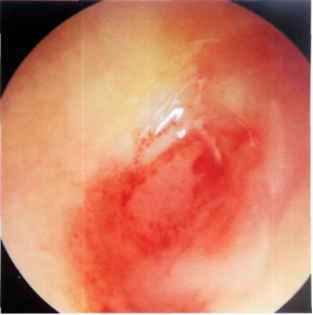 Clinically, the patient complains of otorrhea, itching, and hearing loss. Therapy consists of cleaning the ear to remove all debris and the instillation of local antimycotic preparations as well as lavage with 2% alcohol boric acid drops. 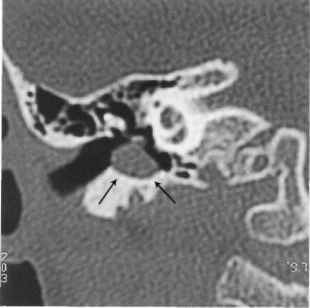 Figure 3.24 Another example of otomycosis in a radical mastoid cavity. Figure 3.23 An ear with chronic suppurative otitis media with cholesteatoma showing a superimposed fungal infection. The blackish fungal masses are easily recognized. They should be removed before local antifungal solution is instilled. 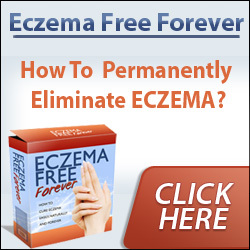 Eczema is a dermo-epidermal process of reactive nature resulting from local or general factors. Local factors include allergy, topical medical preparations, or cosmetics, whereas general factors include hepatic or gastrointestinal dysfunction. It manifests by itching, a bur-ning sensation, vesication, and sometimes serous otorrhea. Treatment consists of discontinuation the suspected causative irritant, correction of the systemic disturbances, as well as lavage with boric acid with alcohol and steroid lotion. Figure 3.25 Right ear. Chronic eczema of the external auditory canal. Squamous debris covering the skin of the external auditory canal can be noted. Successfully treated by the use of local steroid lotion. Cholesteatoma of the external auditory canal should be differentiated from keratosis obturans. The latter entails accumulation of desquamated squamous epithelium in the external auditory canal forming an occluding cholesteatoma-like mass. The patient complains of pain and hearing loss. 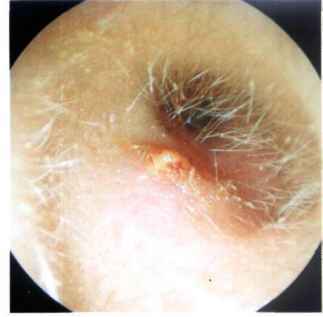 Keratosis obturans is generally bilateral and occurs in young patients, whereas cholesteatoma of the external auditory canal is usually unilateral and occurs in the elderly. In about 50% of patients, keratosis obturans is associated with bronchiectasis and chronic sinusitis. 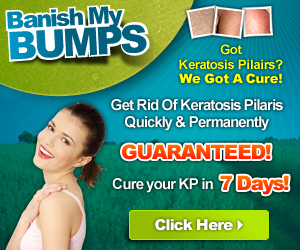 Removal of the mass is sufficient in keratosis obturans. However, in cholesteatoma it may also be necessary to remove the underlying bone followed by reconstruction of the external auditory canal and its skin. Postoperative (iatrogenic) cholesteatoma of the external auditory canal is generally located at the level of the anterior angle of the tympanic membrane. It usually originates from incorrect repositioning of the skin flaps at the end of the procedure. 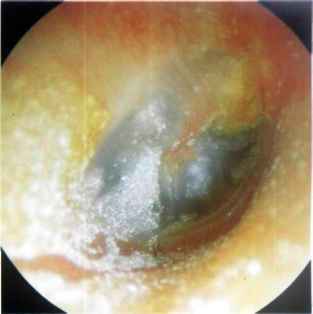 Figure 3.26 Cholesteatoma of the external auditory canal that occurred as a result of incorrect repositioning of the skin flaps in a previous intact canal wall tympanoplasty. This condition is to be differentiated from exostosis. A probe is used to palpate the mass. If it is tender and of soft consistency, cholesteatoma is diagnosed. Figure 3.27 A case similar to that in Figure 3.26. The mass originating from the posterior canal wall inhibits the normal process of epithelial migration towards the outside. 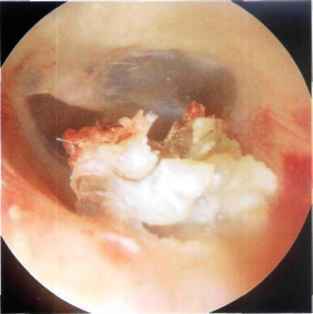 Figure 3.28 Cholesteatoma of the inferior wall of the left external auditory canal being removed in the outpatient clinic. In this case, the squamous debris led to erosion of the underlying bone. Figure 3.30 A case similar to the that in Figure 3.28. The cholesteatoma occupies more than half of the external auditory canal and is in contact with the tympanic membrane. The CT scan (Fig. 3.31) demonstrates partial erosion of the underlying bone. Figure 3.29 Same patient, a few months later. Note the bone erosion caused by the cholesteatoma. Figure 3.31 CT scan of the same case, coronal view. The cholesteatoma is clearly seen in the anteroinferior portion of the external auditory canal with partial erosion of the underlying bone. Postoperative (iatrogenic) cholesteatoma can almost always be removed in the outpatient clinic under local anesthesia using an endomeatal approach. The sac is opened and the cholesteatoma is aspirated. It is advisable to insert a plastic sheet in the external auditory canal for about 3 weeks to prevent the formation of adhesions that could lead to reformation of the cholesteatoma pearl. Cholesteatoma of the external auditory canal should be surgically removed using a postauricular approach. A wide drilling of the floor of the canal is mandatory to avoid recurrences. Some middle ear pathologies can extend into the external auditory canal (e.g., cholesteatomas, glomus tumors, meningiomas, carcinoid tumors, and histiocytosis X). 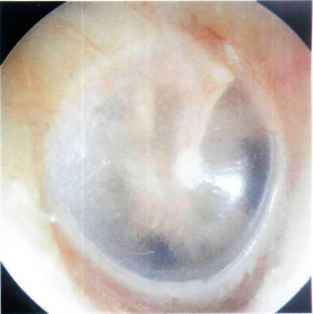 These cases are discussed here to underline the importance of their inclusion in the differential diagnosis of "polypi" in the external auditory canal. Moreover, taking a biopsy of these polypi in the outpatient clinic without proper radiological study is sometimes hazardous. For a detailed discussion of these pathologies, the reader is referred to the relevant chapters. A carcinoid tumor is an adenomatous neuroendocrinal tumor of ectodermal origin. It has the same histologic and histochemical characteristics as other carcinoid tumors that involve different parts of the body. A carcinoid tumor is suspected whenever an adenomatous tumor of the middle ear has acinic or trabecular histo-logic features. The diagnosis is confirmed by electron microscopy and immunohistochemistry to demonstrate the presence of serotonin and argyrophilic granules. Surgical removal is indicated. To avoid recurrence, removal of the whole tumor together with the attached ossicular chain is essential. 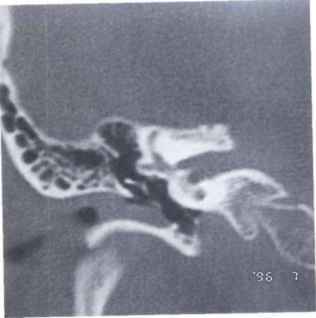 Figure 3.32 This patient complained of hearing loss in the left ear and otalgia of 3 months' duration. 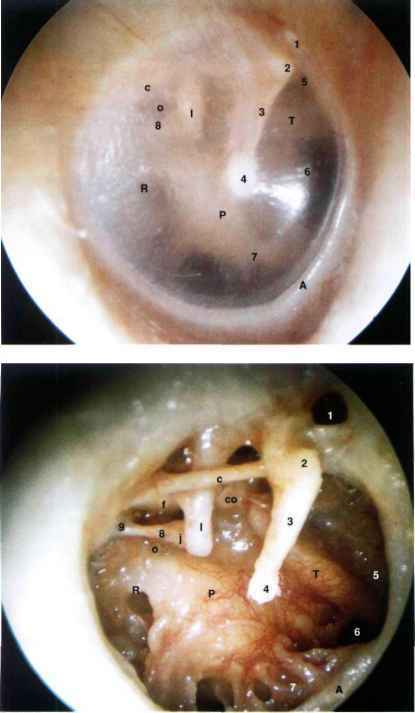 Otoscopy revealed a mass occupying the external auditory canal and originating from its anterosuperior region. 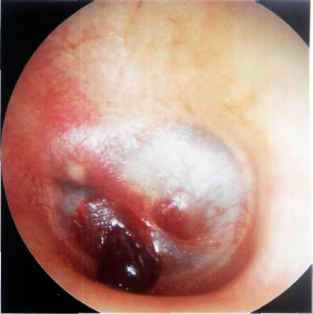 The inferior part of the tympanic membrane, which is the only visible part, appears whitish due to the presence of a mass in the middle ear. 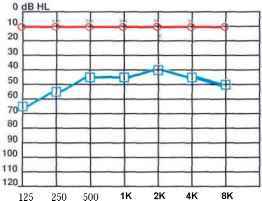 The audiogram (Fig. 3.33) revealed the presence of an ipsilateral conductive hearing loss. The tympanogram was type B. CT scan (Figs. 3.34, 3.35) demonstrated the presence of an isointense soft-tissue mass occupying the middle ear and mastoid with extension into the external auditory canal. No erosion of the ossicular chain, nor of the intercellular septae of the mastoid air cells, was noted. Intraoperatively, a glandular-like tissue was found and a frozen section obtained. The biopsy, confirmed by immmunohistochemical and electron microscopic studies, proved the presence of a carcinoid tumor. A tympanoplasty was performed with total removal of the pathology and the involved malleus and incus. Is it the right or left ear otoscopy? How dangerous can a ear cholesteatoma be? Where is the short process of the malleus when looking in the ear? Where is the cone of light in middle ear? 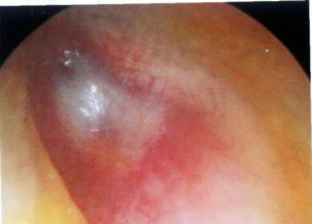 What is a good cone of light tympanic membrane? Can a cholesteatoma be seen bt an otoscope? How maxillary aspergillosis manifests on ct scan? What nerve is seen on exam ot tympanic membrane? 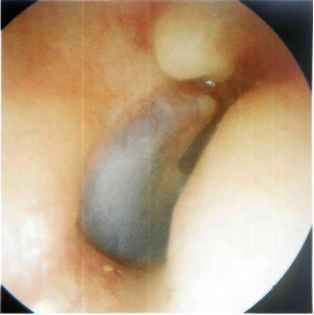 Is the tympanic annulus visible during an otoscopic exam? What never innervated tympanic membrane? Can i see tempanic membrane on otoscope? What is a fungal ear infection? Which is the deepest quadrant of tympanic membrane?